Pretend you're in The Italian Job or get the bus? 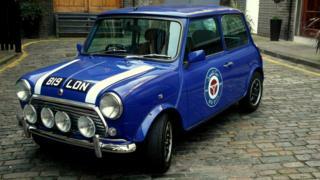 Betty, a resplendent royal blue 1999 Paul Smith Mini Cooper, has just arrived downstairs. Handing over the keys is a tweed-wearing, bearded Tony Grant, who owns 10 such Minis with names like Poppy, Mildred and Lulu. Self-styled "Head Gasket" at Small Car Big City, he is adding a new twist to the car hire and car-sharing business. As part of the fun, there are fancy dress outfits in the boot to match The Italian Job film theme, along with a crowbar and a bar of (imitation) gold. I booked Betty through recently launched car-sharing app Turo, which is aiming to bring an Airbnb vibe to the world of wheels. While car-sharing firms, such as ZipCar which owns its own fleet, have been around for more than a decade, so-called peer-to-peer (P2P) car sharing - private owners renting out their cars - hasn't really taken off. And yet, given that we use our cars just 5% of the time, as Andre Haddad, Turo's chief executive tells me, the business potential remains. This is why Turo, and a handful of other recent start-ups like easyCar, Getaround, and Rentecarlo, are hoping to unlock all this unused capacity sitting idle in the street. "ZipCar's fleets at their maximum reached 15,000 vehicles, so they were not able to reach massive scale," says Mr Haddad. "They obviously built a very successful company, but globally, hourly car sharing reached, at its peak, less than 1% of the entire car rental market space," he adds. For Turo, the minimum rental is a day, he says, and their average is four days. Other firms, like Getaround, which has a presence in 10 US cities, focus more on hourly rentals. Mr Haddad, who describes himself as a car enthusiast, says Turo gives people the opportunity to try out interesting cars, from cute Minis to rugged off-roaders. "It would be really fun to go out in a Jeep Wrangler if you're going up a mountain, but it doesn't really justify owning one," he says. One practical challenge of P2P rental is getting the key to the customer if the car's owner isn't around. Richard Laughton, chief executive of easyCar Club, which launched in 2014, says: "We provide owners with lockboxes they can attach somewhere outside their house, and send a one-use pin to the renter to take the key out, and put it back at the end." Next year easyCar Club will try out unlocking cars by mobile app, he says. Another challenge is overcoming the trust issue. After all, would you rent out your precious motor to a total stranger? "I think one thing that will continually hold back the P2P model is the reluctance of people to put an asset on a shared platform," says Adam Stocker, a researcher at Berkeley University Transportation Sustainability Research Center in California. "The fear that their vehicle gets trashed, misused, or breaks faster - but this is just human nature." One early US car-sharing start-up, HiGear, shut down in 2012 following the theft of several members' cars. So most P2P companies engage in detailed vetting of new members, and incorporate feedback and user ratings. Turo says it has developed machine learning tools to help with the screening process. EasyCar believes telematics boxes could help track how renters have used - or abused - the car and act as a sort of onboard policeman. And what if the renter crashes or damages your car? "Insurance has been a really big challenge," admits Jacob Nielsen, co-founder of Rentecarlo, a P2P car-sharing firm founded by "three guys from Denmark" two-and-a-half years ago. Admiral Insurance has worked with several P2P start-ups to develop a suitable product, says Mr Nielsen. The insurer even allows renters to earn up to five years' no-claims bonus while driving someone else's car, providing they drive more than 30 days in a year, he says. Such innovations and technological improvements have enabled easyCar to "double bookings year-on-year", says Mr Laughton. Other P2P car-sharing firms seem to be enjoying similar rates of growth, as younger people in particular embrace the concept of "mobility as a service" and eschew ownership. So what does this mean for car manufacturers' traditional business models? "I would say 2016 definitely was the year the major auto manufacturers woke up to the shared mobility space," says Mr Stocker. For example, Mercedes-Benz recently launched a car-sharing app called Croove. In September, Ford bought Chariot, a San Francisco-based crowd-sourced shuttle service, and is even investing in a bike-sharing start-up called Motivate. Manufacturers clearly understand that personal car ownership is becoming old hat. General Motors tried to buy Uber rival Lyft this summer, but was rebuffed, despite both companies joining forces to develop driverless taxis. Car sharing may worry public authorities less than house sharing. Property-sharing giant Airbnb has recently come under fire from city authorities - in Amsterdam, for instance - over concerns that it increases city centre congestion and enables guests to avoid paying hotel tax. But car-sharing companies like Turo and others could help decrease the overall number of cars on the road to start with as fewer people see the need to own their own vehicle. But once driverless cars come in, authorities might worry they pose threat to public transport systems, some analysts believe. "It would be very inexpensive to run electric driverless Uber taxis that go around cities and provide transport in a fluid way," says Philippe Houchois, an automotive sector analyst at equity research company Jefferies. "If you get to a point where your cost-per-mile is less than £1," says Mr Houchois, "public transport would seem less attractive." Paradoxically, we could then see a rise in car numbers on our roads, not a reduction.